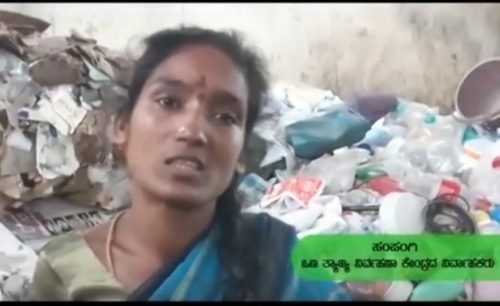 Bengaluru (India) city’s dry waste collection centres (DWCCs) operated by erstwhile waste-pickers and waste collectors have not been paid their dues for more than a year. The DWCCs are waste sorting and aggregation centres set up at the municipal ward level. In February 2017, the municipal authorities took a decision of engaging DWCCs in door to door collection of waste. This measure was taken with the objective of streamlining segregation of waste at source and ensure that different streams of dry waste are destination bound. It would have helped DWCCs exploit their potential to the fullest extent. Further, the measure was to provide sustainable regularised income for the waste-pickers. The decision to ask DWCCs operated by waste-pickers to engage in dry waste collection was termed historic. On their part, waste-pickers kept their commitment of door to door collection of dry waste. In mere one year, they sent 7144 tons of dry waste for recycling and non-recyclables were sent for co-processing. With non-payment of dues, it has become a nightmare for many operators. The waste-pickers are in dire need of cash to continue their work. The dues for all DWCCs collectively amount to almost a crore (10 million). The dues are to be paid towards salaries of the driver, helper and maintenance of vehicle engaged in door to door collection of dry waste. Sampangi is erstwhile waste-picker, operating DWCC in municipal ward no. 181. The DWCC alloted to her is in shambles. This didn’t hinder her from getting to work. She is engaged in door to door collection of dry waste as was asked to do so by the municipal authorities. She has not been paid since August 2017. She has taken the loan and won’t be able to repay it because of non-payment by Bangalore’s municipal authorities. She is asking for the payment for her work. The payment is her right which is constantly being denied to her. Support Sampangi by calling the South Zonal Commissioner of Bruhat Bengaluru Mahanagara Pallike (Greater Bangalore Municipal Corporation- BBMP). 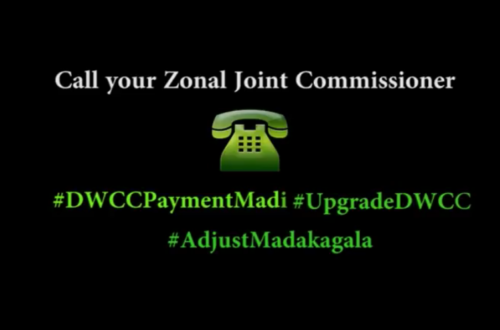 Watch this video and provide support #DWCCPaymentMadi #UpgradeDWCC #AdjustMadakagala.